by Gerard J.Brault, Ph.D. University of Pennsylvania, U.S.A. In Memoriam Dr. Paul Adam-Even Abridged from Coat of Arms no 61 January 1965. 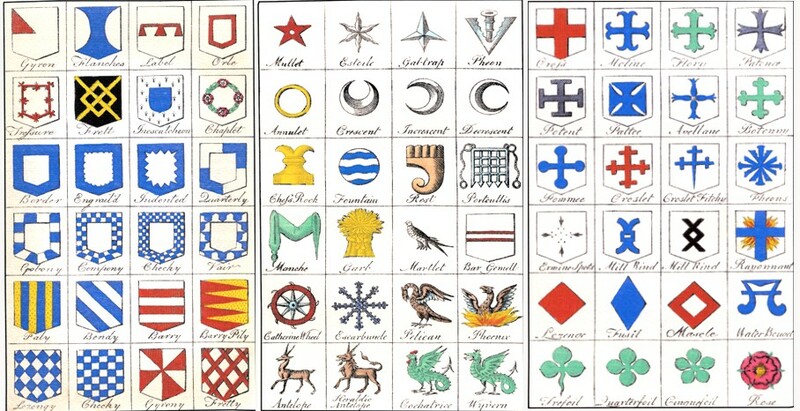 The evolution of true heraldry, i.e. “the systematic use of hereditary devices centred on the shield”,1 has been successfully traced back to the second quarter of the twelfth century through the study of armorial seals affixed to dated documents. This early history may be summarized as follows.2 The first armorial bearings appear on an equestrian seal of Waleran, Count of Meulan, which has been dated between 1136 and 1138. 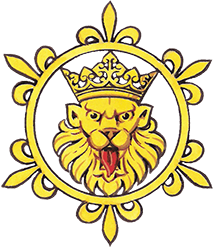 The only earlier clear evidence of heraldry is in John of Marmoutier’s chronicle, Historia Gaufredi, ducis Normannorum et comitìs Andegavorum, dated about 1170 which mentions golden lioncels on Geoffrey Plantagenet’s shield and slippers at his knighting in 1127. From about 1150, heraldic devices, which until that date were not necessarily hereditary – sons at times adopting new arms -became so almost always and throughout Europe. Differencing, i.e. distinguishing the several coats borne by members of one family by small alterations and additions, appears to be synchronous with this development and a rather substantial number of charges are attested before 1200. Women display arms as early as the second half of the twelfth century as do towns, while the clergy is known to have had armorial seals early in the following century. The earliest seal used by a person belonging to neither the nobility nor the clergy is dated 1220, and corporate arms make their appearance ten years later. Though a crest has been found on a French seal dating from 1270, this device was not in general use until the fourteenth century, which also marks the growth in popularity of badges and supporters. In sharp contrast with the rather gratifying advances which have been made by scholars over the past century in establishing this chronology, little progress has been made in the study of verbal blazon.2 Present-day manuals are almost exclusively concerned with the visual aspect of heraldry and with its proper blazon in modern terms. In recent years, a number of excellent articles and notes, several of the finest having been published in the COA, have shed much light on the original meaning and semantic evolution of individual lexical items, but no definition of what it is exactly which distinguishes classic heraldic blazon from other forms of description in Old French and Anglo-Norman has ever been ventured. Mediaeval treatises adopted a similar format in their discussions of heraldic terminology and rules 9 and it was not until Tudor times that the classification of devices into ordinaries (here with the new meaning of “a certain group of linear figures”, said to be the most ancient), subordinaries, and other charges was evolved. No definitive analysis of the language of heraldry in the thirteenth century will be possible until the new critical edition of the Matthew Paris Shields, Glover’s Roll, and Walford’s Roll becomes available.10 Meanwhile, however, the following remarks concerning the emergence of classic form in blazon about 1250 may be of interest to scholars. For there can be little doubt that something important happened around that date to bring about the sudden stylization of blazon. The first blazoned rolls of arms, which appear simultaneously in France and England shortly after the middle of the thirteenth century, provide a remarkable increase in the number and disposition of charges being named for the first time in descriptions of shields. Few, if indeed any, of the terms are peculiar to heraldry, however, and those attested here for the first time anywhere in French were doubtless in current use in other connections (e.g. wearing apparel, architecture) if not in descriptions of shields. The frequently cited rule that blazon must begin with the field, then the principal charge, followed by secondary charges was in force in the thirteenth century rolls of arms, but the rule is often violated in Old French literature. There are, for example, a number of infractions of this rule in the celebrated Siege of Caerlaverock (1300). We must look elsewhere, consequently, for the essential trait which characterizes classic style. The single most important innovation in blazon about 1250 has not, to my knowledge, received any attention from scholars. It consists in what I shall henceforth refer to as the heraldic phrase, which was developed to specify the nature of certain charges and lines and, above all, to indicate the position of any charge. The authors of thirteenth century rolls of arms occasionally neglected to provide us with as precise a blazon as we should like as to the exact charge and line which was intended, but they rarely failed to recognize the importance of indicating very clearly the position of the charge. In the vast majority of cases, both needs were satisfied concisely and clearly. Though there are a few isolated instances of the heraldic phrase in Old French literature before 1250, and though there are many synonymous heraldic phrases in use after that date, the emergence of this element of blazon provides the key to classic style. Unless earlier evidence of consistent use of the heraldic phrase comes to light, we must conclude that classic blazon was born about 1250. The blazon of the Matthew Paris Shields (c. 1244) -a curious blend of Latin and French (e.g. Hugonis Dispensatoris, album ubi benda nigra, aliud gules a or freté)11 — presents an interesting problem. It appears at times to be a crude but partially successful attempt to describe armorial bearings according to classic standards. At other times, however, its blazon in no way suggests familiarity with the style which emerges with the other thirteenth century rolls of arms. The fact that the author chose to write in Latin will doubtless continue to foil all attempts to discover a completely French blazon behind these descriptions. Where did classic blazon originate then? This is another thorny problem which is bound to be with us for many years to come, if indeed it is ever solved, for French was, of course, in widespread use on both sides of the Channel in the thirteenth century. It seems reasonable to suppose, on the other hand, that heralds, who we know were expected to be able to identify armorial bearings at this time,12 had a hand in the standardization of blazon. The writers of treatises in the later Middle Ages and of manuals in Tudor times are notorious for their penchant for technical jargon and have frequently been accused of deliberate obscurantism, their motive, supposedly, being to keep heraldry their private property. Whether this allegation is true or not, it is patently not the case in the development of classic style, which, quite to the contrary, is remarkably simple, concise, and clear language. The sudden refinement in blazon about 1250 may have resulted from the realization that precision in heraldry has legal consequences. The Siege of Caerlaverock in 1300 mentions a legal dispute (chalonge or chalenge) over the right to bear a certain coat of arms. We know also that the language of the law was becoming more and more technical at precisely this moment in history.13 A detailed study of this matter is beyond the scope of the present article but would, as a matter of fact, reveal many interesting parallel developments, though several fundamental differences must be recognized. I believe, however, that the standardization of blazon beginning with the early rolls of arms in the thirteenth century was chiefly brought about for the purpose of answering to the heralds’ need for a mnemonic system to assist them in the execution of their professional duties. There can be little doubt that these patterns, once agreed upon, made the task of learning and remembering how to blazon a large number of shields properly much easier. Anthony R. Wagner, Heralds and Heraldry in the Middle Ages, 2nd ed. (Oxford, 1956), p. 12. Anthony R. Wagner, CEMRA (Oxford, 1950), p. 4. Paul Adam-Even, “Un Armorial français du milieu de XIIIe siècle. Le rôle d’armes Bigot — 1254,” Archives héraldiques suisses (1949), 15-22, 68-75, 115- 121. Wagner, CEMRA , pp. 27-29. Wagner, CEMRA , pp. 58-59. Wagner, CEMRA , p. 60. Wagner, CEMRA, pp. 69-71, 73-78. See, for example, the Boke of St. Albans (1486). For the best discussion of such works, consult H. Stanford London, “Some Mediaeval Treatises on English Heraldry,” Antiquaries Journal , XXXIII (1953), 169-183. Oscar Göschen (“Pusikan”), “Wappen aus den Werken des Mathias von Paris († 1259),” Vierteljahrsschrift für Heraldik, Sphragistik und Genealogie,, IX. Jahrgang (1881), 124. Wagner, Heralds and Heraldry in the Middle Ages, pp. 25-31. See G. E. Woodbine, “The Language of English Law,” Speculum, XVIII (1943), 395-436, and, especially, R. J. Schoeck, “Law French: Its Problems and the Status of the Scholarship,” Kentucky Foreign Language Quarterly , VI (1959), 132-139.